Executives, managers, and users will not trust data unless they understand where it came from. Enterprise metadata is the “data about data” that makes this trust possible. Unfortunately, many healthcare and life sciences organizations struggle to collect and manage metadata with their existing relational and column-family technology tools. 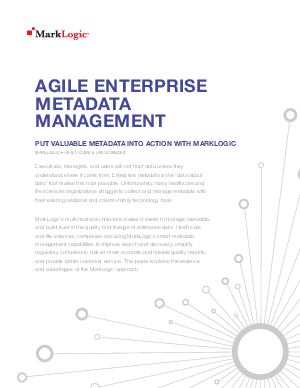 MarkLogic’s multi-model architecture makes it easier to manage metadata, and build trust in the quality and lineage of enterprise data. Healthcare and life sciences companies are using MarkLogic’s smart metadata management capabilities to improve search and discovery, simplify regulatory compliance, deliver more accurate and reliable quality reports, and provide better customer service. This paper explains the essence and advantages of the MarkLogic approach.